Nationally there has been an increase in reported acute flaccid myelitis (AFM) cases since August 2018. Clinicians are encouraged to maintain vigilance for AFM among all age groups and to report patients with acute onset of flaccid limb weakness. Reporting of cases will help states and CDC monitor the occurrence of AFM and better understand factors associated with this illness. Laboratories and healthcare providers in Michigan must report HIV diagnostic test results (“a test result that indicates that the test subject is HIV infected”) to the state or local health department within 7 days of receiving the test result. The CDC uses a reference level of 5 micrograms per deciliter to identify children who have been exposed to lead and who require case management. Lyme disease is the most commonly reported tick-borne disease in Michigan. 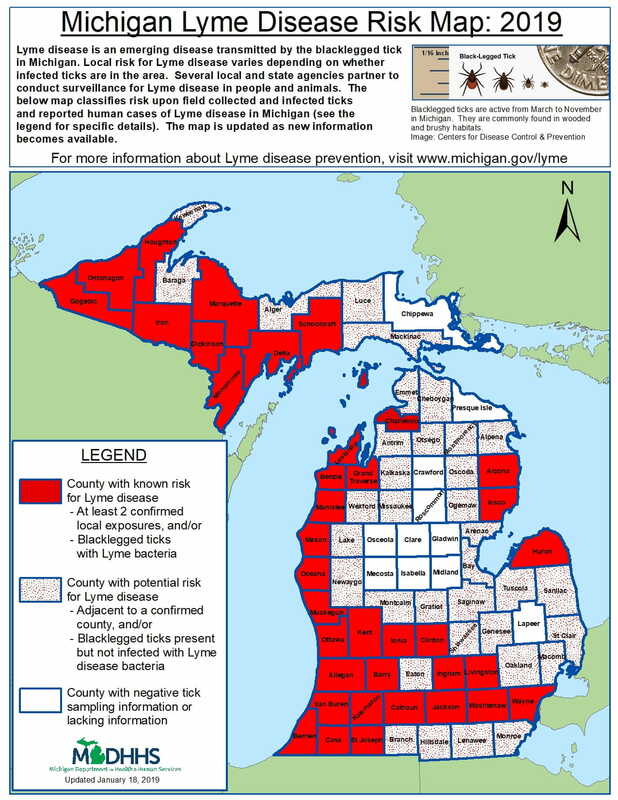 Lyme disease infected ticks have been identified in 34 of Michigan’s 83 counties. department serving the residence of the case.